One of my jobs at the Center for Immigration Studies is to read and interpret legal decisions. When you do that, verbiage is important. Newly appointed Justice Brett Kavanaugh should learn that lesson as it relates to the use of the word "noncitizen". 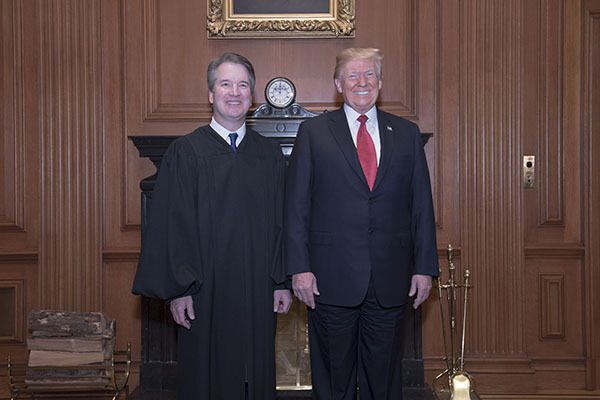 Judge Kavanaugh has served as a judge on the D.C. Circuit since May 30, 2006. He has also sat, by designation, on judicial panels of the U.S. Court of Appeals for the Eighth Circuit and the U.S. Court of Appeals for the Ninth Circuit, and also served on three-judge panels of the U.S. District Court for the District of Columbia. During his tenure on the bench, Judge Kavanaugh has adjudicated more than 1,500 cases, almost all while a member of either a three-judge or en banc panel of the D.C. Circuit. Put into perspective, that is about 9.5 cases per month, or about one every two work days. That is superhuman jurisprudence. With that said, however, Justice Kavanaugh should follow the teachings of that wise legal scholar, Mark Twain, who famously stated: "The difference between the almost right word and the right word is really a large matter. 'tis the difference between the lightning bug and the lightning." The sole question before us is narrow: whether, under [section 236(c) of the Immigration and Nationality Act (INA)], the Executive Branch's mandatory duty to detain a particular noncitizen when the noncitizen is released from criminal custody remains mandatory if the Executive Branch fails to immediately detain the noncitizen when the noncitizen is released from criminal custody — for example, if the Executive Branch fails to immediately detain the noncitizen because of resource constraints or because the Executive Branch cannot immediately locate and apprehend the individual in question. No constitutional issue is presented. The issue before us is entirely statutory and requires our interpretation of the strict 1996 illegal-immigration law passed by Congress and signed by President Clinton. I will allude to that last sentence at the end. My major point is Justice Kavanaugh's use of the wrong word: "noncitizen". He is correct that the decision in Preap is "entirely statutory", as my March 21 post explains in detail. The language used by Congress in section 236(c) of the INA, and how to interpret that language, was the issue. This is an important point, because Congress is deemed to say what it meant and mean what it said, and even if reviewing courts don't like the policy, they must interpret it faithfully unless it is contrary to the Constitution. Simply put: Words matter. Ironically, however, Justice Kavanaugh used the wrong words, or rather the wrong word, 19 times in his extremely brief concurrence: "noncitizen". The Supreme Court is generally known for the precision of its language, and so Moncrieffe raises the question whether "noncitizen" is an appropriate legal term for a person who is subject to removal under section 240 of the INA. The answer is "no"; I will therefore attempt to delineate amongst the terms. First, section 101(a)(3) of the INA, in the "definitions" section of that act, states: "The term 'alien' means any person not a citizen or national of the United States." Section 101(a)(22) of the INA, in turn, states: "The term 'national of the United States' means: (A) a citizen of the United States, or (B) a person who, though not a citizen of the United States, owes permanent allegiance to the United States." With due respect to Justice Ginsburg, the distinction actually does have practical impact today, as I explained in that post. Again, with only the highest respect for the judicial achievements of Brett Kavanaugh, he is dead wrong. Can the executive branch remove certain "noncitizens from the United States when the noncitizens have been convicted of certain crimes?" Yes. Can it remove all of them? No, because the term "noncitizen" has no legal meaning except to the degree that Congress has set forth. U.S. Immigration and Customs Enforcement (ICE) has recently become a target from certain quarters because of its enforcement of the immigration laws the Congress has written. This is particularly ironic, because many of those quarters have offices at the top of Capitol Hill. That said, I would join the chorus of ICE's detractors if it were to attempt to remove a resident of American Samoa or Swains Island (noncitizens) from the United States. If, as an immigration judge, ICE had presented a resident of American Samoa or Swains Island to me, that individual's case would have been terminated immediately with my profuse apologies to the respondent on behalf of the United States, and some strongly worded admonitions to the ICE trial attorney. But that never would have happened, because they, and ICE generally, know the law. Only "aliens" are inadmissible, only "aliens" are deportable, and only "aliens" may be removed. Note that there are situations in which there may be a question as to whether someone is a national of the United States, in much the same way as there may be questions as to whether someone is a citizen of the United States. Absent such questions, however, nationals of the United States do not belong in immigration court or in immigration detention. Why did Justice Kavanaugh use the wrong term? Your guess is as good as mine, and I am loath (professionally) to ascribe motivations to individuals where those motivations are not clear. If I had to guess, however, Justice Kavanaugh is likely on his best behavior given his "contentious" confirmation process. I hope, however, that that is not true, but that rather neither he nor his clerks appreciated the distinction. If it is true, however, two points are in order. First, as Twain's quote above makes clear, the right word matters, and this is truer in statutory interpretation than it is in the writing of novels. (NB: I will admit that in writing the preceding sentence, I used the phrase "more true" before Microsoft Word reminded me that those are the wrong words. Even a soulless computer system knows the truth of the importance of proper verbiage.) If the Supreme Court, or any court, is to do a proper statutory analysis, it must focus on Congress' intent as expressed through the exact words Congress used. In any event, I am confused as to why the term "alien" appears to have become derogatory, at least in the minds of certain individuals. It is a descriptive term that has been used to describe individuals who are not citizens or nationals in American law at least as far back as 1798. I appreciate when I travel abroad that I am an "alien" (or whatever the local term is for someone who is not a citizen), and that I am obliged to follow the norms, customs, and (most importantly) laws of that country, not the United States; I take no offense, and understand that I may be treated differently than the citizens of the country in which I find myself. In any event, Chief Justice Roberts' admonition brings me to my last point, as promised above, which is Justice Kavanaugh's statement: "The issue before us is entirely statutory and requires our interpretation of the strict 1996 illegal-immigration law passed by Congress and signed by President Clinton." The use of the word "strict" to describe a piece of legislation is a moral judgment that has no place in a judicial opinion. Would I use the word "lax" in describing the 1986 amnesty? As a pundit, yes; as a judge, no. Judges get to write opinions, not have them. Schoolhouse Rock, and the Constitution, teach that a bill becomes a law when the president signs it. Often the Supreme Court will explain that a given bill was signed by "the president." But on rare occasions, the justices will refer to the president by name. Does this SCOTUS name-dropping matter? If the Court merely notes which president was in office when Congress passed a specific bill, there is no problem. That fact, in the legal lingo, is merely descriptive. However, if the Court identifies the president to make a broader point — for example, that the bill was passed by a liberal or a conservative — there may indeed be a problem. The Court should resist the urge to wade, or even dip a toe, into partisan squabbles by naming the politicians responsible for legislation, unless, of course, those facts are necessary to resolve a given a case. Professor Blackman asserted the implication of Justice Kavanagh's reference to President Clinton was to the following end: "The Court was not being 'strict' toward immigrants; a bipartisan Congress and Clinton were being 'strict' toward immigrants. In other words, don't blame us for interpreting the law in a tough fashion — even a Democrat was fine with it." The justices should be careful about naming politicians, especially when they name in order to make a point about the political process. Citing legislative history from members of Congress who supported or opposed a bill is completely justifiable; those statements were designed to inform the law's meaning. But it is generally a mistake to focus on the identity of the person whose only contribution was to sign the bill into law. Although this error does not violate any ethics rule, it's worth avoiding for the sake of keeping the Court as far away from politics as possible. Kavanaugh's reference to Clinton was right on the borderline. Curiously, however, notwithstanding his point about the court avoiding politics, Blackman did not specifically opine on the wisdom of using the adjective "strict" at all, even though it goes to the heart of "mak[ing] a point about the political process." Judges often point to their role as "umpires" calling "balls and strikes" in a game in which they did not make the rules, the essence of Chief Justice Roberts' statement above. Is a law "strict"? As a judge, if the law was clear and constitutional, I would not know and would not care. In the future, I hope that Justice Kavanaugh doesn't either.